If he did it before! Usually I write after the storm is over for me. This time I am going to write about it as I am going through. As you all know or can assume, I am out of work due to having my daughter. Black Friday was supposed to be my going back date but due to the fact we couldn't find a babysitter or daycare and I had vacation pay due to me we decided that I should take another week off. I talked to my manager in advance signed the paperwork let's go right! Wrong. 1st my job tried to say that I didn't work on my anniversary date so I wasn't eligible for vacation pay. Lies I worked my anniversary date. And I called payroll they said I had 30.67 hours. 2nd I got a phone call from my manager basically stating that I wasn't allowed to get my vacation pay because they have blackout dates between Black Friday and the First of the year. You would think the store manager would have known this before he approved my vacation pay hence he DIDN'T which is why he was calling me smh. And on top of that there is no hours available for this week and may not be much next week. I have put in many applications since being off and haven't heard a thing. This year has been an uphill battle. I realize I have been in this place before and sometimes even worse but if God brought me out before this is nothing. I believe there's a reason I am off of work. I know that God will make a way for me and I know he will do the same for you. So keep the faith and I will keep you updated on the process or progress of the situation stay encouraged. I always talk about getting rid of people and how everyone can't come with you to your next level. I figured I never listed them or gave you the characteristics. Liars and backstabbers are a given so they won't be listed. Half-Truths😏- These are the people who tell only half the truth and half a lie so you can't really say that they are lying. They tell you what they think you need to know or just enough so they don't look guilty. Victims😧😭- These people are ALWAYS the victim. They always give a sob story.They always want you to feel sorry for them. They always have there bottom lip poked out. It's always as though the whole world did them wrong and they did nothing to cause it. Non-Movements😪- These are the people you encourage you pour into them and no matter how much you encourage or pour into them they are encouraged at that moment but never move. These people are dangerous because they can make you stagnant. You could waste so much time trying to get them to move you may not realize how much life has passed you by. Idea Thief 😈 - this person is someone who will listen to your ideas and turn them around and use them as if it's there own. It's like the contestants on the Price Is Right that once you say 500 they say 501. Life's a Mess 😎- This is the people where there life is a mess but they always want to give you advice. They can NEVER seem to fix there life but they always have a solution for yours. Hope this helps look at your circle or even yourself if you have to and make changes. We often look at our past and want to kick ourselves for the decisions we made. The statement "if I only knew then what I know now" but you had to go through your mistakes to learn. I belong to a few Facebook groups, and sometimes when people post they will say "How did I do? Be nice" most of them really mean don't correct me. But I believe if your not corrected you will never learn. We live in a society where it seems wrong to have an opinion. You had to go through the mistakes to get to where you are. Don't kick yourself embrace yourself. Without those experiences you would have never be where you are. Okay let's go because of my childhood and my parents divorce I was able to cherish my family and be willing to fight for it if need be. Because of my childhood I love my daughter harder. I make sure I protect her. I made promises to myself even as a child how I would raise my children. Life isn't easy. Every comment you get won't be nice. You will have embarrassing moments you may even wat to kick yourself but don't because where you are now is where your supposed to be. Things happened to get you here. You have decided to walk away from what has been holding you back. Yay! Good for you right!? But it's not always that easy. If you have a heart or if that person really meant something to you it's easier said than done. Even afterwards we still question ourselves if we made the right decision. Earlier this year, I believe I was watching a sermon from Kirk Franklin I had just found my notes the other day. Anyway, he said "it's not our place to die on the cross for our friends Christ has already done that." We will put ourselves on the back burner for others. We try to carry their cross or burden ourselves. It's not your place to do that. It's one thing to pray for someone or be there for them but not to the extent that we lose full focus on our own mission. God put you on earth to fulfill your purpose. We get so wrapped up sometimes being there for others that we get distracted on our own mission. Although we may see what a person needs to do to change, change will NOT occur unless they see it themselves. It's not for not for us to make them see. You have to pray about it and leave it up to God. Your purpose is too valuable to be wasted on someone who can't see there own. If something happens or if the person goes the wrong way again we feel guilty DON'T! That person may not have went through the experience that will get them to change. It's not up to you to be someones savior Jesus already has that covered. Don't feel guilty for walking away, you have done all that you can. As you know I love Kia Stylez hairstyles. Her styles are fresh, chic and clean cut. If you can't get enough of her work look her up. Kia calls this style "links"
To accomplish what you were sent to do on this earth your mind have to be changed. How you view yourself and what you're capable of as well. The other day I was thinking it would be cool to see into the future but if you think about it our own feelings of ourselves would mess it up. Doubt would set in and we more than likely won't get to our purpose. When you were a child you didn't know fear. Think about your imagination you thought ALL things were possible. The problem was when negative aspects were brought about it made fear present. Example: When I was 5 years old and in kindergarten my teacher told us the truth about life. We could be other people as in physically change into people. And if we were bad when we died we would burn in fire forever. Needless to say,that scared the hell out of me. I had no idea first of all, what death was at the time. Secondly, I sure enough didn't want to burn forever. Because of this reality check so to speak it stressed me out as a child. I had a fear of death. I always was checking my heart beat. I was a stressed out kid at 5 smh. Before that happened I was care free. Afterwards, I was never the same fear followed me. We have to go back to being childlike. I am not saying being blind to your consequences or actions. But childlike in the sense that your fearless. As a child you may want to have about 5 different professions. If someone told you that you couldn't be all 5 you would argue someone down about it. That's something we have to do as an adult we have to fight for our future. We have to fight past what we think of ourselves. Lately, I have been looking for another job and being stressed out in the process. The thing is I have been looking for someone to give me a position at their company manager or otherwise while I was already an owner of my own businesses. 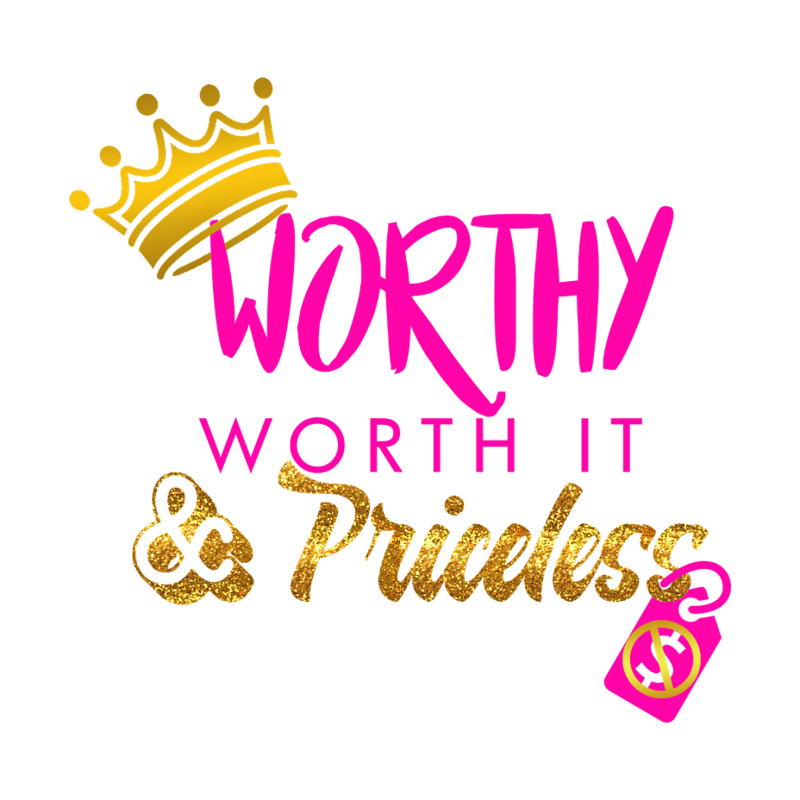 I have laid the ground work to further Worthy Worth it & Priceless or Tammy Simmons Designs but I have stopped myself short several times. No longer can we sit on our purpose. No longer shall we allow fear to rob us of our destiny. I have previously stated this on Facebook I'll share it here as well. "God didn't give you talent to be afraid of using them. He also didn't put you on earth to not fulfill your purpose. Don't let fear rob you of your future or your purpose on this earth. There is something inside of you that's waiting to get out. Stop standing in your own way and go live the life your supposed to. Come out of the limits you put on yourself and see yourself as who you were really born to be. While I am sitting her waiting for my little princess to go to sleep she goes through so many emotions literally. She looks around dozing off , she then smiles, jumps up like she's scared then starts laughing. She'll keep repeating this til she finally goes to sleep. But as she's going through those emotions I can't help but go through my own. Although I am with her father I still put a lot of the pressure on myself. I had a friend tell me I have to do what's best for me and my daughter. In trying to do what's best during my leave from work I have been trying to find another job. Needless to say, even with a degree it's hard to find the pay or the hours you need. Long story short I started to get discouraged. It's stressful when your trying to get somewhere in life and you can't get there or the opportunities just aren't there. myself don't give up. You might find yourself having the same emotions as my daughter one minute your fine the next your scared thinking about your future. The time now is to smile. You may not get your reward as fast as others. You might have to work a little harder but you will never get anywhere if you give up. Below are songs to give you encouragement as well as a sermon from Kirk Franklin. Okay the songs are great but that sermon blessed my soul so much today I had to share I am hoping it'll bless someone else.